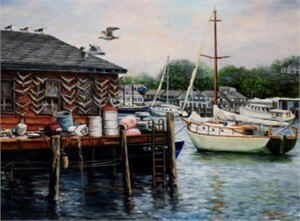 Eileen Patten Oliver has been painting in both Maine and Massachusetts for more than 55 years. She studied with Paul Shea, Peter Nyren and Constantine Sgouras & was chosen to take a class at Mass College of Art while still in high school. Life circumstances prevented her from continuing her formal training, but she continued to learn from other painters and learned much on her own. She was the Art Chairperson and managed the art gallery at the West Quoddy Head Light visitor’s Center in Lubec, ME for several seasons in the early 2000’s and taught Adult Education Painting at the Lubec Consolidated School An award winning painter, she has participated in many solo and group shows in both Maine and Massachusetts. Her paintings hang in many private homes and businesses. Eileen was inspired by the incredible beauty of the Down East Maine coast, and after moving to Cape Ann in 2010, she discovered the quality of light, natural beauty and architecture that are all unique to the area offered boundless subject matter. Eileen paints not merely to document images of places or people, but to capture the spirit and intensity of that one magic moment with her brush. Eileen’s art awards include the Mary Alice Arakelian Memorial Award for work in Oil at the 17th Annual Regional Juried Show at the Newburyport Art Association in Newburyport, MA for her painting “The Schooners”, Best Painting In Show at the 2016 Magnolia Historical Society Art Show in Magnolia, MA, for her painting “Heading Out”, and Third Best In Show at the Peabody Art Community Center for her painting “Somesville, Maine”. Eileen’s greatest influences have been some of the Cape Ann Masters… Emile Gruppe, Frederick Mulhaupt, Anthony Thieme, and Aldro Hibbard among many others. Some of the current great painters of Cape Ann, such as Jeff Weaver, Ken Knowles, T.M. Nicholas, and Mark Shasha are also sources of great inspiration and influence for her as are the great marine painters, Thomas Hoyne, Fredrick Judd Waugh, Christopher Blossom and Don Demers. 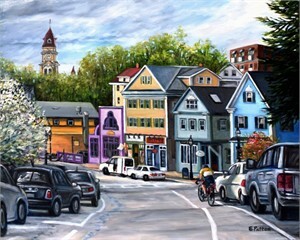 An Artist Member of both the North Shore Arts Association and the Rockport Art Association & Museum, and former member of the Newburyport Art Association and Rocky Neck Art Colony, Eileen is originally from Waltham, MA and lived in Maine from 1998-2010. She currently lives and paints in Gloucester, MA with her husband, Cape Ann native James Oliver, who is also an award winning graphic artist. Eileen Oliver Eileen Patten Oliver has been painting in both Maine and Massachusetts for more than 55 years. She studied with Paul Shea, Peter Nyren and Constantine Sgouras & was chosen to take a class at Mass College of Art while still in high school. Life circumstances prevented her from continuing her formal training, but she continued to learn from other painters and learned much on her own. She was the Art Chairperson and managed the art gallery at the West Quoddy Head Light visitor’s Center in Lubec, ME for several seasons in the early 2000’s and taught Adult Education Painting at the Lubec Consolidated School An award winning painter, she has participated in many solo and group shows in both Maine and Massachusetts. Her paintings hang in many private homes and businesses. Eileen was inspired by the incredible beauty of the Down East Maine coast, and after moving to Cape Ann in 2010, she discovered the quality of light, natural beauty and architecture that are all unique to the area offered boundless subject matter. Eileen paints not merely to document images of places or people, but to capture the spirit and intensity of that one magic moment with her brush. 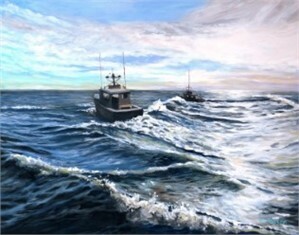 Eileen’s art awards include the Mary Alice Arakelian Memorial Award for work in Oil at the 17th Annual Regional Juried Show at the Newburyport Art Association in Newburyport, MA for her painting “The Schooners”, Best Painting In Show at the 2016 Magnolia Historical Society Art Show in Magnolia, MA, for her painting “Heading Out”, and Third Best In Show at the Peabody Art Community Center for her painting “Somesville, Maine”. Eileen’s greatest influences have been some of the Cape Ann Masters… Emile Gruppe, Frederick Mulhaupt, Anthony Thieme, and Aldro Hibbard among many others. Some of the current great painters of Cape Ann, such as Jeff Weaver, Ken Knowles, T.M. Nicholas, and Mark Shasha are also sources of great inspiration and influence for her as are the great marine painters, Thomas Hoyne, Fredrick Judd Waugh, Christopher Blossom and Don Demers. An Artist Member of both the North Shore Arts Association and the Rockport Art Association & Museum, and former member of the Newburyport Art Association and Rocky Neck Art Colony, Eileen is originally from Waltham, MA and lived in Maine from 1998-2010. She currently lives and paints in Gloucester, MA with her husband, Cape Ann native James Oliver, who is also an award winning graphic artist.